For aspiring home buyers in Toronto who have lost out on one property after another, the following article in The Globe and Mail is for you. A couple searching for a home discuss their story on how they finally won in a bidding war. After reading this article, the condo or loft option seems to be a much easier route, as opposed to buying a freehold property in Toronto. They lost eight bidding wars. They are now there, but last year at this time the pair was mired in despair. “We were rookies,” says Ms. Levy of their introduction to multiple offers. 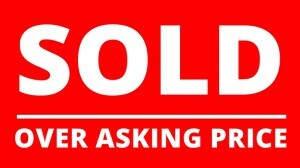 At first they thought that offering the full asking price might be enough to beat their rivals. After a few bidding skirmishes, they were so discouraged that they approached the landlord of the house they had rented and offered to buy it from him. They left notes on the doors of houses they liked, asking homeowners if they would like to sell. They tried a few bully offers on properties that were actually on the market. That tactic didn’t get them a house either. Part of their dissatisfaction stemmed from the fact that they kept shelling out money for home inspections and still ending up without a house. The winning strategy, says Ms. Levy was to go in with no conditions and a healthy chunk above the asking price of $700,000. The couple had their financing pre-approved and had done yet another home inspection before the offer date.